IMPORTANT UPDATE: the core concept here, marketers must begin measuring “time with brand” to guide media strategies for long term brand building, has been picked up by Forbes, via contributor Pat Hanlon. Enjoy his piece, “Your Brand Needs a Fitbit” here. Brand advertising is intended to give meaning to a brand in order to build brand equity…so where should brand building dollars go? Should digital attract advertising dollars from the brand part of the budget? Some think digital is all about call-to-action…click-through leading to conversion rates…and that the brand-building ability of digital is minimal…so they reserve those dollars for traditional approaches such as TV and print. Digital publishers continue to fight for brand advertising dollars but the argument is still not persuasive to many. I think the brand building power of digital marketing can be enormous but marketers need to think differently to unlock this opportunity. Start with this supporting piece of evidence: from a path to purchase study on many products I consulted on for AOL called “buying at speed”, we found that those who browse daily or weekly online for a given type of product, often just as a form of media behavior, are more than twice as likely to know what specific brand they will buy before they shop! That is certainly reflective of digital’s power to build brands, but what might the mechanisms be? Prof. Kevin Lane Keller writes that brand knowledge (leading to brand equity) is multidimensional…ranging from basic familiarity with the features and functions of a brand to visual recognition of logos, to preferences and deep emotional meanings. Prof. Byron Sharp has proved that even basic brand awareness creates purchase advantage. Online shopping behaviors lead to building brand knowledge…that is what explains the AOL study findings. It follows that any advertising, communication, or experience that builds knowledge about a brand is brand building! However, I am not suggesting that they are all equal in their brand building power. But here’s a way to compare and contrast the brand building power of different forms of brand communication and it will lead marketers to some new brand building priorities. I suggest that brand meaning comes from people spending time with your brand. The more time, the more meaning-building. I have even trademarked the term “tyme with brandtm” because of this belief. Under this model, a display ad (seen for perhaps 1 second) would have some brand building power but not as much as a 30 second TV commercial or online video where a brand can convey its positioning and values. A visit to a brand website for 3 minutes gives an opportunity for an even fuller brand narrative and would beat viewing a 30” TV commercial. (Although note that it is a lot easier to buy views of your commercial that earn visits to your website, especially among current non-buyers). A Facebook newsfeed update or Tweet, by itself, would be on a low rung of this “time with brand” ladder, but can lead to many impressions that will accumulate if the content gets widely shared or if it leads to website visits. Even the brand building power of in-store shelf exposure can be quantified using this model. How about brand usage experience? Consider a brand of beer…you can drink it, see your friends drinking it, see a TV commercial, watch an entertaining video online. What is the relative contribution to time with brand? Marketers probably don’t currently measure what this “time with brand” piechart looks like or how their average time with brand compares to competitors…but they should. I think this would become an essential part of insights supporting an experience-led marketing approach. This concept might also help to explain why attachment to Facebook and Starbucks is so high. We spend 40 minutes a day on Facebook and Starbucks, well that is the “third place” and we can spend an hour or more there nursing a venti coffee and a banana nut cake. People can spend time with your brand beyond functional purpose by consuming your digital content and “playing” with your brand app, website widgets, etc. Finally, an essential element is that this new framework is measurable and can be used as part of a media optimization platform. Spend your brandbuilding money to maximize time with brand subject to budget! This thinking provides a powerful perspective for brand builders. Not only do I believe that spending time with a brand builds equity and meaning, we have the evidence to prove this. - longer experiences, such as usage/consumption and in retail often have the greatest impact on brand consideration. - within the digital environment we see across categories the power of YouTube and a company’s own website. Of all online experiences these are normally the most engaging and persuasive. - overlooked touchpoints can be the most powerful at building brand meaning. For example, for Pepsi in the UK we saw that experiences in On Premise and being featured in KFC ads brought people closer to the brand. Traditionally, On Premise would be seen as a channel for sales not brand building. - even with above the line touchpoints, like Posters, we have seen that in certain categories, those at train stations or bus stops (commuter touchpoints where people have time) receive a more positive reaction than those where they have less time to take in the message. - along with actual time, there is the receptivity people have to advertising. For TV advertising we see that in certain categories people’s reactions to the same TV ads are more positive on certain days and at certain times, suggesting a time and depth dimension to the experience. We have developed a set of Experience Metrics (Experience Reach, Share, Positivity etc) which are proving powerful. Share of Experience is more predictive of brand growth than Share of Voice (as it includes Owned, Earned and Environmental touchpoints as well as Paid). We can compare TV, digital,in store and consumption experiences using the same metrics (rather than relying on GRPs, click-throughs and footfall). However, understanding Experience Time is not something we have used and we should build into our approach. 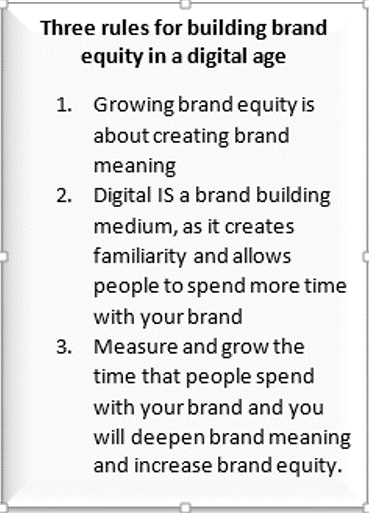 Thank you for highlighting this valuable link between brand meaning and time spent. thanks so much Fiona for bring the construct to life with data! Gratified that what you have tends to be confirmatory and certainly marketers need to take note of your unique ability to provide this powerful new metric.